What if all your wishes really came true? came true. Because they never freakin’ do. Kayla wakes the next day to a life-sized, bright pink My Little Pony outside her window. Then a year’s supply of gumballs arrives. A boy named Ken with a disturbing resemblance to the doll of the same name stalks her. As the ghosts of Kayla’s wishes-past appear, they take her on a wild ride . . . but they MUST STOP. Because when she was fifteen? She wished Ben Mackenzie would kiss her. And Ben is her best friend’s boyfriend. But Kayla McHenry, You Wish‘s protagonist hated the pink. She hated everything during her sixteenth birthday party where her mom used it more as an event to market herself as an event organizer for the sweet sixteen birthday market, and her best friend ditched her for a date with her boyfriend, who incidentally, Kayla has been in love with for the past three years. (Okay that sentence was mouthful) It was a truly sucky birthday, and I couldn’t blame Kayla for acting that way, and wishing that wish that changed everything. And wishes. I’ve written about how I used to make wishes with my review of Jackson Pearce’s As You Wish, but Mandy Hubbard’s newest novel literally takes the cake at wish fulfillment. 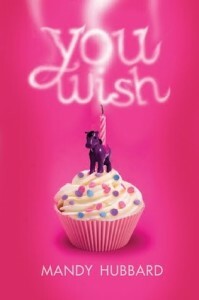 You Wish is a sweet, sort of coming of age story with lots of fun, toys and lessons learned for girls who are growing up. The entire story kind of reminds me of 13 Going on 30, but perhaps it may just be because of the pink and yes, the wish. For the next two weeks after Kayla’s disaster of a sixteenth birthday, one wish from her past birthdays come true, with hilarious results. It wouldn’t have been a big deal if Kayla wished for mere toys as she grew up (like what kids would wish for birthday gifts or Christmas gifts at redenvelope.com), but she had to wish for more outrageous things. A real pink My Little Pony? Raggedy Ann Doll coming to life? A shower of gumballs? Become a mermaid? Have bigger breasts? Practically everything that a little girl and a teenager would wish for as she grows old came true for Kayla, and it wasn’t fun at all. Not to mention that Kayla’s best friend is slowly drifting apart from her, and she feels more and more attracted to Ben…Kayla had to find a way to undo the wish, and fast, before her last wish for Ben to kiss her comes true. I haven’t been reading much contemporary YA lately because I feel like almost everything has been overdone. Come to think of it, I think this may pass as speculative fiction given the magical elements, so yeah, I guess I still stayed away from them! But I digress. I love how the author tackled the story without magic overpowering everything. True, having all those wishes coming true at that extent is unbelievable, but at some point in the story, I started to believe that those things were actually happening to Kayla. The magic wasn’t a way to escape, too, but to show Kayla how much she’s changed, and how much things are changing around her. However, these wishes also taught her that she also had the power to change herself and somehow effect the same change around her if she really wanted it. Kayla’s character development was painful to read for me, because I know how it feels like to “lose” a good friend because she suddenly had a boyfriend. I wasn’t in love with her boyfriend, mind you, but she was so in love with him that our friendship was…well, discarded. Thinking about it still kind of stings until now, and unlike Kayla, I haven’t had the chance to repair that discarded friendship because the other party doesn’t seem to want to (or maybe she’s kind of oblivious). I wanted to reach inside the book and comfort Kayla in her lonely moments, but I was glad at how the author handled that in the story, by not pointing the blame at a single person. Friendship issues are never uncomplicated, because as the saying says it takes two to tango. Kayla and Nicole’s friendship in the book was at the stage where they could choose to grow in it or just leave it, and Ms. Hubbard resolved it beautifully.